Comforting, warming, and invigorating, cooling at the same time. This duo is a perfect match for your taste buds and for the Fall season. The radishes, in particular, are fantastic to keep your immune system strong and help you clear out any bugs like the flu that you may catch, as they help dispel phlegm and have strong antioxidant properties. 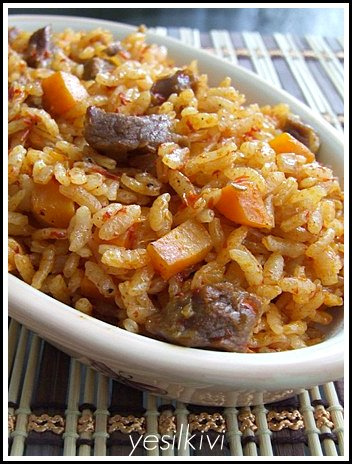 Since this is the main meal, one serving is a generous 1 cup of prepared rice pilaf. Makes about 4-6 servings. In a medium or large skillet, warm 2 TBS of olive oil on low-medium heat, then add the carrots and sautee until tender but not overcooked (about 8-10 minutes). Set carrots aside in a bowl to cool. In a large stockpot or casserole pot with a well fitting lid, warm up 3 TBS of olive oil on low-medium heat. Once oil is warmed up (be careful it’s not too hot or smoking), add onions along with with 2 tsp sea salt and stir occasionally on low-medium/medium heat until softened. In the meantime, bring to a boil the stock in the same pan used for cooking the carrots. Add the cubed lamb, cumin, and black pepper to the onions and continue to stir. The meat will first let go of its juices and then soak them back up. Wait until the meat has soaked up all its juices and has been nicely browned before continuing. Add the rinsed brown rice, allspice, and cinnamon to the meat and onions. Stir until the rice is warmed through. Add the boiling stock to the rice/meat/onion mix and stir a couple of times to dislodge anything stuck to the bottom of the pan. Tightly close the lid, bring to a boil, then turn your flame down until there’s a brisk but low simmer in the pot. The rice should take about 40-50 minutes to cook. Check the rice after about 35 minutes, and turn down the heat if the liquids are boiling off too fast. Once the rice is cooked, turn off the heat, fluff the rice with a rice paddle or large serving fork and let the rice “rest” for about 15 minutes before serving. Taste before serving and adjust the spices to your liking. The cinnamon-allspice blend should taste balanced – neither one should overpower the other. One serving is approximately 1/2 – 3/4 cup. Makes about 4-6 servings. Mix all the ingredients, except for the water. Let stand in the fridge for at least an hour before serving, for the flavors to intermingle. It’s even better the next day. Add the water about 15 minutes before serving. Adjust lemon juice / mint / oregano / pomegranate syrup to taste. The gazpacho should taste sour-sweet, mostly sour, with a nice lemony kick to it. Serve chilled but not too cold. Vegan: For the rice pilaf, use vegetable broth instead of chicken broth. Instead of lamb, add peas, roasted almonds or almond slivers, and finely chopped kale, and navy beans. The Radish Gazpacho is already vegan. This recipe shared with you courtesy of Delicious Health, Inc., a health, nutrition, and lifestyle consultancy whose mission is to transform busy bodies into healthy, balanced beings (TM). Learn more about Delicious Health at www.enjoydelicioushealth.com or www.delicioushealthblog.com. Have a deliciously healthy day! Only 3 ingredients and NO COOKING involved? YEAH! I made this recipe up one morning when I wasn’t too hungry for breakfast, needed something filling and satisfying and easy to eat to hold me off until lunch, and I had a bunch of odds & ends in my fridge… as usual when it’s close to the end of the week. And given that I need to manage my blood sugar levels and adrenals carefully due to my fibromyalgia and chronic fatigue tendencies, this was the perfect breakfast – healthy fats, a good dollop of protein, fabulous fiber. For me, this is intuitive “cooking” at its best. I had this as breakfast, but it can easily be an appetizer or snack (1/2 the recipe). Creamy, crunchy, sweet, savory, deeeelicious, and nutritious. A great recipe, I say. Let me know what you think. Oh – and I’m looking for a new recipe name for this. I don’t think what I have is deserving enough. Enter a comment below to send me your ideas! Makes enough for 1 breakfast serving. Have 1/2 for a snack or appetizer, or dessert! Drizzle honey over both sides. Marvel at how pretty it looks. Grab a spoon and scoop away! I haven’t tried this – but if you’re having this for dessert, melt some 70% dark chocolate in a ben-marie (double boiler) and drizzle instead of the honey. WOWEEEEE YUMMYYYY! Believe it or not, avocado and chocolate go really well together. I love making up recipes on the fly. Just thought of this. This recipe shared with you courtesy of Delicious Health, Inc., a health, nutrition, and lifestyle consultancy whose mission is to transform busy bodies into healthy, balanced beings (TM). Find us at www.enjoydelicioushealth.com or www.delicioushealthblog.com. Have a deliciously healthy day! Cook! SF’s Fall Cleanse – Delicious, Easy, and with a Special Discount for Delicious Health Peeps! Do you want to break your sugar addiction? Heal from the inside, out? or deprive yourself of deliciousness? 7 Day Cook! SF Cleanse September 18, 2009! available for San Francisco Bay Area residents only… for now. Based on Dr. Mark Hyman’s Ultrametabolism principles, endorsed by Drs. Marsha Nunley and Neha Sangwan, and in partnership with Delicious Health, the Cook! SF Cleanse is designed to decrease internal inflammation by removing common allergens from the food we eat during a weeklong feast of delicious, fresh whole foods meals. The Cook! SF Cleanse week begins Sept 18th, so please sign up by Saturday, Sept 12th to join us. Use Coupon Code cDH 0909 for your Delicious-Health-only $10 discount. CLICK HERE TO LEARN MORE & SIGN UP. This is one of my personal favorites; one of the dishes I beg my mom to make each time I go home to Turkey or they come visit us in SF. NOTE: The use of nightshade plants in this recipe can be avoided by omitting tomatoes from the stuffing and stuffing zucchinis rather than eggplants, tomatoes, or peppers. Put green peppers, olive oil, and water/broth aside. Mix all the other ingredients well. Stuff the green peppers equally. Put their “hats” back on. Place stuffed peppers upright in a pot big/small enough to prop them all up. Pour the olive oil over the stuffed peppers. Cover with water or broth. Bring to a boil on high heat; then reduce to medium heat. Cook until done, about 40-45 minutes, when the rice is visibly cooked through. Stuff small eggplants, medium tomatoes, or small zucchinis using the same recipe. These veggies need to be big enough to be able to carve out the insides in order to stuff them, but small enough to have a reasonable serving size (about 1 cup of food per stuffed veggie, or less). Sprinkle hot red pepper flakes in the stuffing, to taste. Get creative with which veggies you stuff, and let me know! If you share this recipe, please include this blurb with it:This recipe shared with you courtesy of Delicious Health, Inc., a health, nutrition, and lifestyle consultancy whose mission is to transform busy bodies into healthy, balanced beings (TM). Find us at www.enjoydelicioushealth.com or www.delicioushealthblog.com. Have a deliciously healthy day! I fell in love with jicama (pronounced “hekuhmuh”) during our March trip to the Yucatan. The fruit plate I’d get would have jicama in it, and now I just cut it up and eat it like a fruit, although it’s really a root vegetable. Root veggies – like beet roots, celery root, sweet potatoes – are generally associated with winter months and warming dishes. The great thing about jicama is that you can have your root and eat it too – in the summer! Sooo refreshing, especially for the warmer months. Great source of fiber, low glycemic, naturally low calorie, filling, crunchy, sweet, no need to cook it – what more can a busy girl ask for? This recipe shared with you courtesy of Delicious Health, Inc.
Find us at www.enjoydelicioushealth.com or www.delicioushealthblog.com. Have a deliciously healthy day!